The Colorado Buffaloes’ football team entered their Oct. 13 game against the USC Trojans with a 5-0 record (2-0 in Pac-12 play) and ranked No. 19 in the country. Now, the Buffaloes are 5-5 (2-5 in Pac-12 play) and looking worse every week. And it appears that Colorado’s season collapse may have cost Mike MacIntyre his job as head coach. Denver7 (ABC affiliate) reports that Colorado and MacIntyre will part ways at the end of the season. 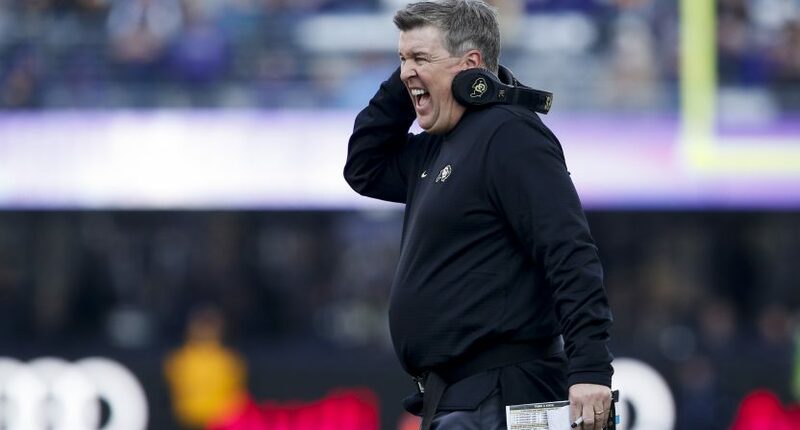 Multiple sources have told Denver7 that the University of Colorado will part ways with football coach Mike MacIntyre effective at the end of this season. MacIntyre, 53, took over as CU’s head football coach in 2013, after leading the San Jose State Spartans to a stunning 10-2 record in 2012. Things haven’t gone as well for MacIntyre with CU. The Buffs have gone 46-64 in MacIntyre’s six seasons as head coach, and have only reached one bowl game (a loss in the Alamo Bowl during the 2016 season). It appeared that this may be the season CU takes the next step under MacIntyre, but it’s looked like the same old disappointing Buffs program over the last five games, and that’s in a Pac-12 conference that’s been a huge disappointment this season (only one Pac-12 team is ranked in the CFP top 24). After Saturday’s 31-7 loss to Washington State — the fifth defeat in a row for MacIntyre’s team — he was asked if he’s ever had a season go downhill like this one. MacIntyre has three years and $9 million remaining on his contract after signing a five-year, $16.25 million deal in January 2017. With this news emerging, it will be interesting to see if MacIntyre even finishes the season as the Colorado football coach. It’s likely to be an awkward situation for everyone involved for the final two months if he sticks around in Boulder. And then it will of course be interesting to see who CU picks as MacIntyre’s replacement.